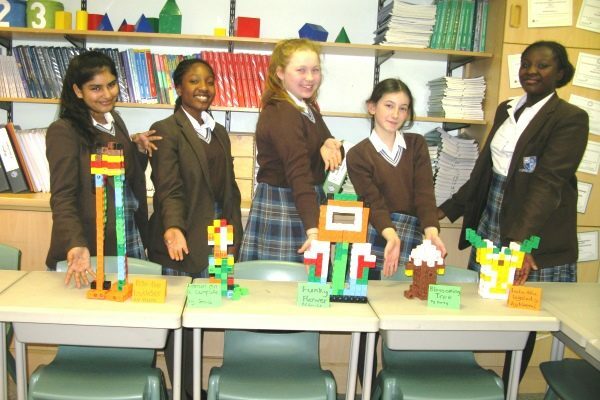 Year 8 pupils have been working to create something with multi-link cubes in their Maths lesson recently. Success criteria was to to create something tall and symmetrical and to name their creation. Mrs Alahi and Mrs Moon judged Emilie’s ‘Funky Flower’ to be the overall winning creation. Well done Emilie! Naomi’s ‘Lulu the Legolady’ was the runner up. Well done Naomi! Daisy worked diligently to create ‘The Blossoming Tree’, another lovely creation. Ayra created ‘Bob the Builder’, perhaps Bob on stilts, please see the photograph above! Last, but not least, Grace created ‘A Person on a Campsite’ and surrounded him with lots of grass! Well done Grace! It was an entertaining, engaging and fun lesson.